Andy Murray ground down David Ferrer 4-6, 7-6, 6-1, 7-6 on Friday to reach his second consecutive Australian Open final, raising British hopes of ending a 75-year drought for a men's singles grand slam champion. Murray, runner-up to Roger Federer last year, was rocked by the seventh-seeded Spaniard's relentless baseline play as he lost the opening set on a chilly night at Rod Laver Arena. Ferrer had a point to move two sets clear before Murray levelled the match with a dominant tiebreak and Murray mowed through the third set as his opponent lost his rhythm. Murray appeared to be coasting at 2-0 in the third but the moody Scotsman wobbled in the decider to allow Ferrer to break back and rally to a tiebreak. 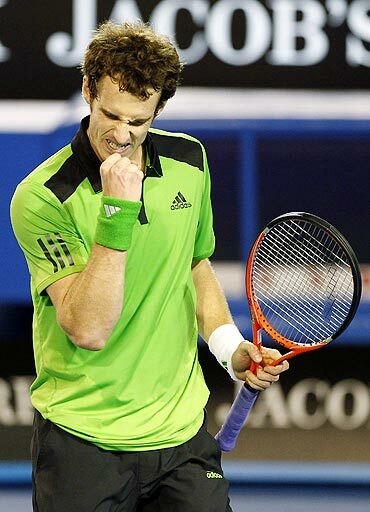 Pumping himself up in an electric atmosphere, fifth-seeded Murray ratcheted up the pressure with some brilliant serving to bring up five match points, before sealing it 7-2 with a deft half-volley. Murray will play Serbia's Novak Djokovic for the title on Sunday as he bids to become Britain's first men's champion at a grand slam since Fred Perry in 1936. 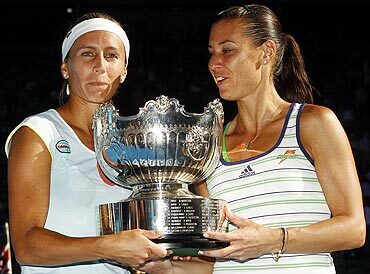 Argentine Gisela Dulko and Italy's Flavia Pennetta beat Eastern Europeans Victoria Azarenka and Maria Kirilenko 2-6 7-5 6-1 to win the Australian Open women's doubles titles on Friday. The top seeds produced a stirring fightback from a set and 4-1 down in fierce Melbourne sunshine to seal victory on their first grand slam final appearance together. 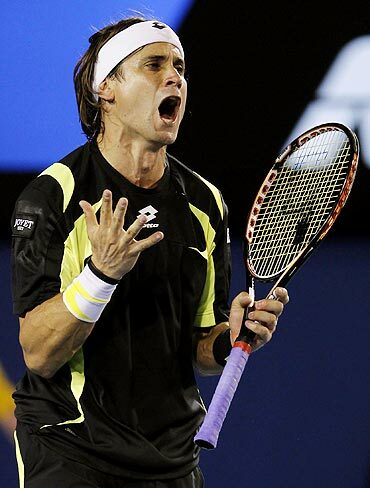 "A set and 4-1 down we were like in shock," Dulko told reporters. "In the changeover, we were like looking each other and saying, 'Come on, we can't finish the match playing less than an hour in the final.' We just kept fighting." The world's top two doubles players earned $450,000 for their victory over Russia's Kirilenko and Azarenka of Belarus, the 12th seeds playing their first major together.